The Internet nowadays is in every field of our life – entertainment, education, and even business, which means that almost every company currently needs to be presented online. Moreover, a site, being an additional tool for promotion and business attracts new customers. As a result, a website is a necessary thing for creating and conducting a modern and successful business. Currently, even a novice without special knowledge can design and maintain a professional-looking website, which will be able to attract prospective customers. Moreover, it is possible to save money and create the website without hiring specialists in programming. Even someone without any skills in web design can easily make a pleasant looking site. Likewise, there are even special resources, which allow simple website creating without too much effort. Templates right now are a powerful tool for an easy site creation. Both professionals and novices due to a wide range of various types of templates can use them. As a result, it is a perfect instrument for website creating even for those, who do not know even a thing about coding. Some templates are even created for these users and offer powerful admin panel with easy features for design and content management. As a result, currently there is no need to learn to code for the purpose of creating a nice and pleasing website – instead, there are simple instruments even for novices. For example, templates by the MotoCMS are perfect for beginners – easy management tools with impressive results allow adjusting a website accordingly to the requirements. Such templates as Italian Restaurant Responsive, Cafe and Restaurant Responsive, Bakery Responsive, Sweet Shop Responsive, and Massage Salon Responsive are unbelievably easy for website creating. All of them share the same features, due to the reason that they were made by the same author in the same time. These templates are famous by their simplicity combined with incredible functionality. 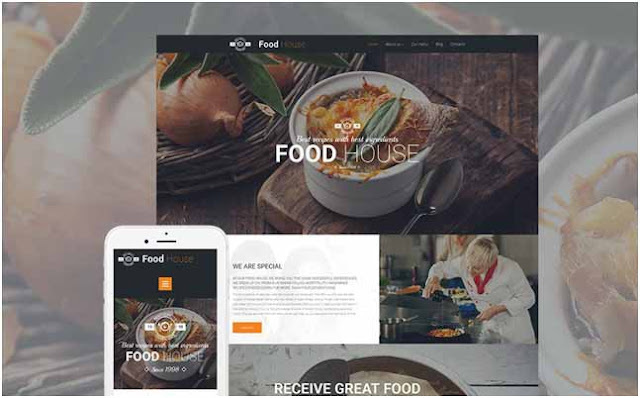 A variety of designs, customer friendliness, and online support are making them stand out among other templates for restaurants and cafes. In addition, useful admin panel with tips and possibility to edit by simply dragging and dropping photos is easy to learn. In turn, social features and widgets make the website interactive and offer a great opportunity to receive feedback, write blogs and do anything in order to attract a new audience. Availability of the mobile versions and cross-browser friendliness ease the amount of work needed for establishing a site, which will look the same on all kinds of devices and browsers. This feature is incredibly important because the testing process takes a lot of time and effort by programmers and developers. To sum up, even those without special knowledge in coding can quickly set up and update their sites without using hideous website builders. On the other hand, these templates share the same problem. Sadly, there is no tool that can organize online food order for the website users. This feature is incredibly important for those, who want to combine promotion with functionality and use every feature to the fullest. Hence, this peculiarity is crucial for owners of big restaurants or cafes. Small business can easily go on without any additional components and use a pure version of these templates exclusively for promoting purposes. As a result, the site can be a powerful promoting tool, although it is not created for selling products and services. All things considered, they are perfect for those who want a website for a purpose of online promotion and communication with customers. They are easy to set up and use, and flexible content management system allows creating the most suitable site. All these features highlight them amongst other templates. In conclusion, online presence and having a pleasant, unique, and attractive website is crucial for business, and no wonder why so many people choose these templates for their sites.